Years ago it was very common for mothers to teach their daughters basic daily tasks like cooking, cleaning and sewing. Back then most homes had sewing machines and moms filled your closet with homemade outfits sewn to perfection. Or they at least knew how to thread a needle and sew on a button, mend a sweater or darn a sock. Patterns were cheap and easy to follow and sketching a dress idea led to designing and sewing your one-of-a-kind outfit. This was how fashionistas were born at a young age. This is what happened at Toni Davison’s home growing up. Her mom taught her to sew at age nine and she sewed everything, from clothes to curtains, until she became a mom herself. “I had to shift gears once I had my daughter,” said Davison. A few years later she kept the cycle going and began teaching her daughter Tiah how to sew. They started with four sewing machines in the den and invited some of Tiah’s friends and it took off from there. Then they added a mobile business providing afterschool programs at eight schools, Girl Scout programs and sewing-themed birthday parties. 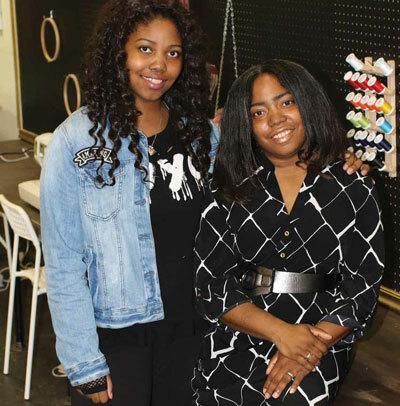 With a little push from her husband, Davison found a storefront in downtown Mount Clemens and the Fashion Factory Sewing and Design School opened its doors with a dozen sewing machines, a runway and every color of thread needed to inspire fashionistas of tomorrow. Encouraging girls with a passion for fashion is the Fashion Factory’s goal. Davison still does the mobile classes five days a week during the school year. 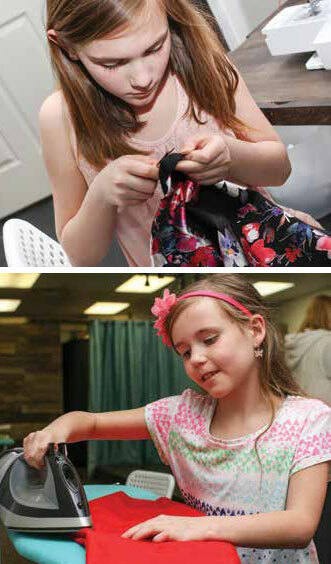 And now at the downtown location there are weekly classes where one can learn sewing techniques and complete fashionable garments, which are then modeled on a runway. Workshops are available for one-time sessions. Serious sewers can join as a member using the studio and the equipment on a weekly basis, moving at an individual speed, learning from the Glam Squad on site. “Once the students learn the basics of sewing safety on a sewing machine, they tackle a project, finish it and end class with a fashion show. The fashion show gives the girls a chance to be proud and builds confidence. They have made bags, skirts, shorts, dresses, backpacks, and leggings,” said Davison.